The first time I ever used an iPhone was in 2008, not long after I had moved into my first studio apartment in Chicago, equipped with a circa 2006 Motorola Razr and no home Internet connection for the entire first month. Someone in the required core class of my M.A. program let me look at her iPhone 3G, and I was impressed at how much more capable it was than my flip phone. Easily scrollable contacts, maps, games, a real Web browser: 2008-me was bowled over. That feeling of novelty continued for a while, through at least the (leaked) introduction of the iPhone 4, after which most of the major smartphones coalesced around hi-res displays, fast cellular networking and Wi-Fi, and a comprehensive selection of apps. That same feeling of “this is so obviously the future” did not accompany my unboxing and initial try-on of the Apple Watch Sport I ordered in late April and received in early May 2015. That’s not a slight at the Watch, though. Almost no device in the history of consumer electronics was so well-positioned for dominance as the first few iPhones, which were right at the intersection of a device class that many consumers were already invested in (cell phones), functionality that they already used on other discrete devices (e.g., MP3 playing on iPods; Web browsing on PCs and Macs), and a global set of business and technology standards (carriers and the GSM specifications) that could be tapped for growth. The Watch, in contrast, is entering into the loose, mostly unproven “smartwatch” category. It isn’t replacing networked devices the way the iPhone succeeded the Razrs and Samsung Blackjacks of the world. Its predecessors for many consumers seem to be either inexpensive wristwatches – with or without digital displays – or nothing at all. 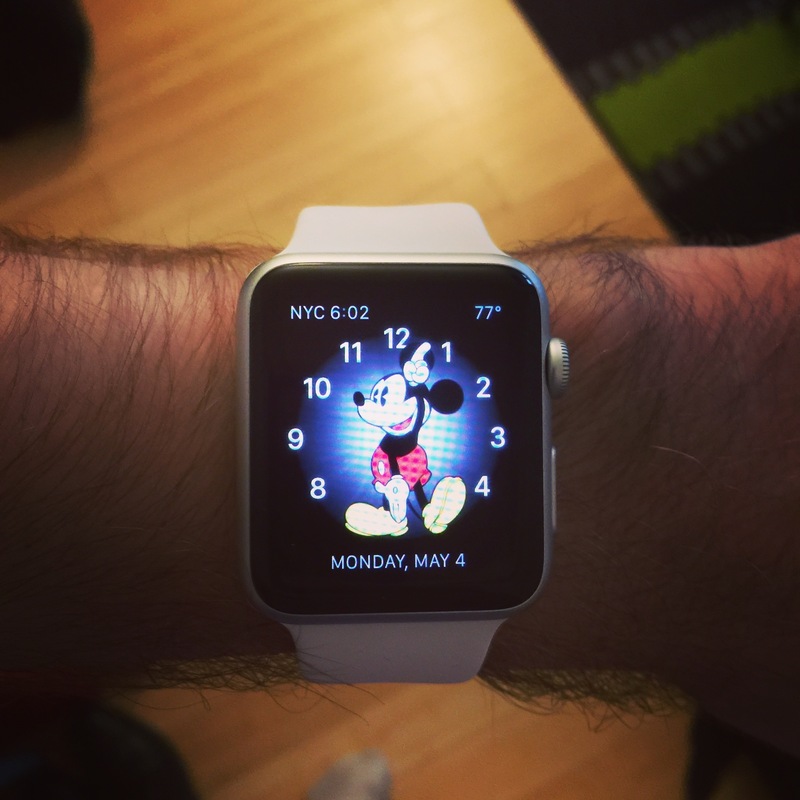 For my part, I never regularly wore a watch prior to trying out the Apple Watch Sport. In this sense, the Watch is a lot more like the original iPod than the iPhone: a new approach to activities that were largely un-networked or mostly “offline” in the past (music listening in the case of the iPod; health tracking, timing, etc. with the Watch). I tried on both the Apple Watch and Apple Watch Sport at the 5th Avenue Apple Store prior to ordering. The Sport was significantly lighter, a big advantage for me in particular since I was planning to use it mostly as a companion during exercise, not as a piece of jewelry. My review will focus only on the Sport, 42mm model. The Sport comes with short and long bands, both made of fluroelastomer. Putting on the Watch took me a few tries to get right: The notch is lined up with a series of holes – like fastening a belt – and then tucked into an opening to complete the loop. The bands connect to the Watch body via two slots that can be controlled with the small buttons on the back of the Watch. You may need a pencil or long fingernail to press them precisely enough to release the band from the Watch itself and swap it out for one of another size and/or color. All versions of the Sport have a light gray exterior, except for the black band version, which comes with a space gray casing. The screen is OLED Retina. Its lower resolution vis-a-vis the iPhone 6 Plus (with which I paired mine) is apparent when viewing screenshots on the iOS/OS X Photos apps. On the Watch itself, however, almost everything looks great, especially Apple’s own apps. Craig Hockenberry has broken down the relevant differences between LCD and OLED display technology. 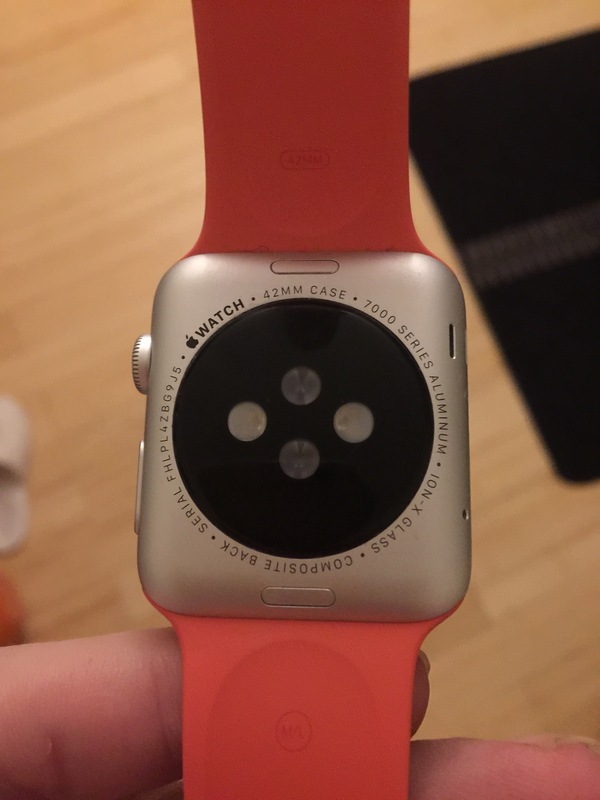 There are 4 total exterior hardware buttons on the Watch. The Digital Crown is the main one. It serves as the toggle between the watch faces and the app “honeycomb” (the equivalent of the home screen grid on iOS), a back button (if you tap it once while in an app, it goes back to the honeycomb; if you tap it twice from the watch face, it goes back to the most recently used app), as a scroll control, as a Siri activator (long press), and as the way to perform “regular” watch functionality such as setting a timer. The other button on the side does much less. It brings up your contacts and serves as a power button if held in. The underside of the Apple Watch Sport. Note different color band. The underside of the Watch houses the lights that are used to measure your heart rate, as well as two more buttons which are used to control the band clasps. The lights enable a common medical technique in which green lights are shined onto your skin to be absorbed by the blood flow just beneath the surface. Since blood is red, it absorbs green light, and the Watch sensors can track the amount of absorption to approximate your heart rate. The Watch sensors also include a haptic feedback engine that gives you a tap on the wrist during certain notifications. Apple introduced another OS with the Watch, stylishly known as watchOS. I don’t think it’s possible to write a Siracusa-style review of watchOS since it seems designed to be as minimalistic as possible. It basically has two faces (no pun intended). The first is what I would call the watch side, which consists of the face you have chosen as well as the glances below it and notifications above it. The face displays the time as well as any “complications” – weather, physical activity, Calendar events – that are clickable and can take you to the respective Watch applications. As on iOS, the notification center slides down from the top and shows all notifications from both Watch applications and from your iPhone. For example, you may get pings from Activity on your Watch (an app that doesn’t notify you on your iPhone), as well from iPhone-only apps such as iTunes Store. Glances are pulled up from the bottom, much like Control Center on iOS and they are navigable from left to right. Glances, more so than fullscreen app immersion, seem to be the de facto way of interacting with most software on the Watch, especially since they can convey a lot of information before the Watch screen automatically powers itself off after 7 seconds if nothing is done (to save battery). 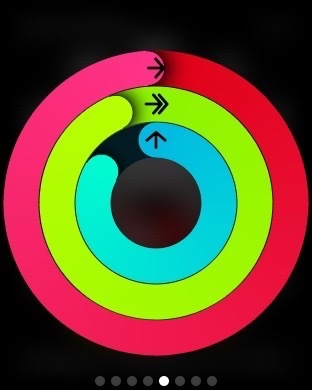 You can pull up a glance to see where you stand on your Activity ring, what the current weather is, your most recent heart rate reading, etc. You can even any audio playback (from any app) from your iPhone using the Music glance – this has been an immensely useful feature, allowing me to avoid fishing out my phone while on the subway or walking. 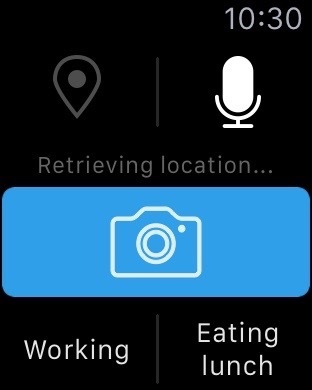 There’s also a Watch equivalent of Control Center, with familiar options such as Do Not Disturb alongside new features such as pinging your iPhone if you can’t find it (surprisingly common!). The second is the app “honeycomb,” buried behind a click of the Digital Crown. Using it is straightforward if you have ever used iOS. Tap to enter an app. You can touch and drag to rearrange the apps. This screen is the only way to get to useful utilities like the stopwatch, workout tracker, and certain third-party apps. Many of these – Mail, Music, Maps – I never enter. The glances are usually enough. The standout (“killer” is so cliche) app is Activity, which gives you a look at your moving calories, minutes exercised, and hours during which you stood and moved around for at least one minute. It has a useful glance, and by default it proactively notifies you when to stand (if you haven’t done so during the first 50 minutes of the hour) and gives you updates on your progress. So what non-Apple apps are good? I agree with John Moltz that Yummly helps enhance the Watch’s utility in the kitchen. It’s great to be able to dismiss notifications or respond to texts via voice or canned replies while you are in the middle of cooking and don’t want to get your phone even more dirty than it already is. Uber provides one-tap car requests. Day One makes it super-easy to make a diary update from your wrist. The Day One app on the Watch – one of the best. Beyond those three, my favorite so far is Acorns, the micro-investment app. You can view your portfolio value from the glance, and use Force Touch (i.e., a harder-than-normal tap on the screen) to invest more money. It really takes advantage of the Watch’s software and hardware. For now, Watch apps are not downloaded on their own. Instead, they are installed when you download the “parent” iPhone app to your iPhone. So if you install Fly Delta on your iPhone, its Watch app is sent to your Watch. Deleting the iPhone app will delete the Watch app. 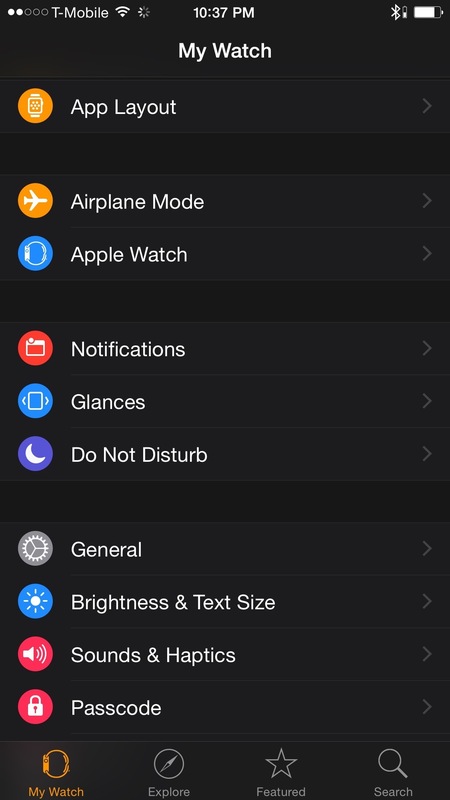 The Watch has its own Settings app, which controls functionality like Siri and Do Not Disturb. The more nuanced controls, though, are found in the Apple Watch app now installed on all iPhones running the most recent version of iOS. 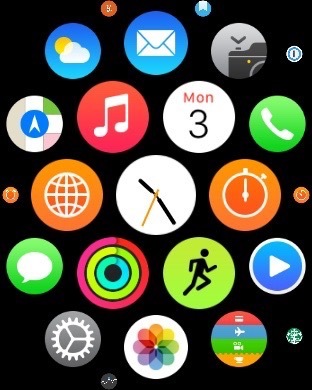 From there you can do everything from rearrange the honeycomb to toggle which apps do and do not appear on the Watch. System updates to watchOS are also handled from this iPhone app. The Apple Watch app on iOS. Third-party app performance is spotty. The apps are essentially running on your iPhone and then transmitting data to your Watch over Bluetooth and Wi-Fi (both must be turned on all the time to keep the Watch paired). Swapping-in additional bands is easier than I thought. Apple sells them for around $50 each for the Sport. You’ll need to click the two mini-buttons on the back of the Watch to release the clasps so you can insert the new band. Don’t expect another iPhone – and that’s a good thing! The Watch is meant for now as a companion to your iPhone, not a rival to it. It shines most during workouts – especially the Sport, with its lightweight aluminum and durable bands -, in the kitchen, and as an interactive terminal for dealing with notifications. Both its software (mostly glance-oriented) and its hardware (no cellular connectivity) speak to its limitations. It takes the pressure off of feeling compelled to look at your phone all the time – if you get a call or message, it’s show right there on the Watch, so you won’t miss it. It feels and looks good on the wrist and is nicely unobtrusive. I worried beforehand about it being a mini-iPhone attention black hole, sending a deluge of notifications, but those can be toggled as needed, and I don’t get that many to begin with. The mythical “steep learning curve” is just that – I didn’t find the Watch hard to get used to at all, and I expect I am hardly alone judging by the user satisfaction numbers so far. Definitely worth a try if you already have an iPhone 5 or newer.